Pain in the neck can be due to injury, a mechanical or muscular problem or even a nerve irritation. The pain can range from very mild discomfort to severe, burning pain. If the pain is acute – sudden and intense – it is likely to be a ‘wry neck’, where the small joints at the side of the spine (facet joints) become irritated. If the pain has lasted more than three months, it is termed chronic neck pain. 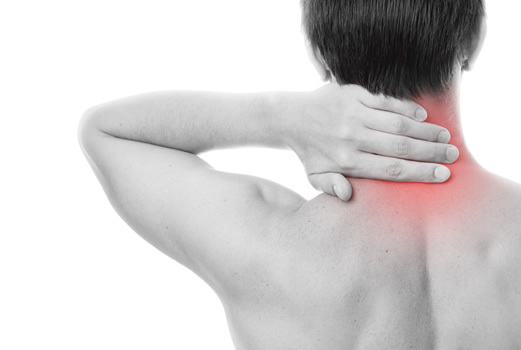 Neck pain is generally pain found in the local area, either on both sides, or on one side only. There may be stiffness in the joints of the spine, and possibly tightness of the neck muscles. Pain may radiate down to the shoulder or between the shoulder blades. Occasionally it can travel further down one arm, and even cause tingling in the fingers. When neck pain is severe it is rarely due to a serious disease, and you can still recover quickly. The spine is extremely strong, and very difficult to damage. Most neck pain comes from the muscles, ligaments and joints in your spine, but in most people we cannot identify the exact source of pain. X-rays are not particularly helpful in identifying what is wrong –the changes seen on X-ray are normal changes that come with age. The best approach to neck pain is to get it moving, to do exercises, and to keep fit. We now know movement is better for it than rest, as previously thought. Physiotherapy can be an extremely beneficial treatment for neck pain. We can provide you with advice on your posture and exercises. We can also perform manual treatment on your joints and muscles, to help restore normal movement and reduce pain. The physiotherapists at Holcombe Health Clinic have years of experience in helping people with neck pain. Contact us for an assessment, advice or treatment.